The Brazilian government is to launch a campaign as part of an effort to get 300,000 guns off the streets and to cut the country's high murder rate. Anyone who hands over a firearm will receive between 100 and 300 reais ($60- $185) and will not be investigated if they were illegally holding the weapon. The campaign will be promoted by advertising on television, radio, newspapers and the internet. A similar move four years ago helped remove 500,000 guns from the streets. The Brazilian government is to spend more than $28m on this campaign. Officials from the justice ministry say they hope to get 300,000 weapons off the streets before the end of the year, and as a result help to cut Brazil's high murder rate. As well as receiving financial compensation, those who hand over weapons have been assured they will not be subject to a police investigation. 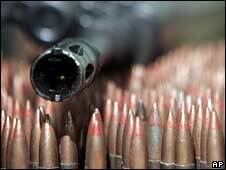 The authorities are also keen to encourage the registration of weapons that are held illegally. The police in Brazil believe that between 500,000 and a million handguns are unregistered, and from next January this will be punishable by a sentence of up to six years in jail. Justice Minister Tarso Genro says the government hopes the campaign will get people excited about taking part in what he called "a culture of peace". In a referendum held in 2005 Brazilians rejected a ban on gun sales and the level of violence in Latin America's largest country remains high, although there are some encouraging signs. A government study found that gun related killings fell by 12% between 2003 and 2006, but this still involved a number of dead of more than 34,000 people in just one year. The government will at least be hoping the new campaign will encourage the downward trend.